Lake Wanaka is located in the Otago region of New Zealand, at an altitude of 278 meters. Covering an area of 192 km2 (74 sq mi), it is New Zealand's fourth largest lake, estimated to be more than 300 m (980 ft) deep. Its name is Māori, a corruption of Oanaka ('The place of Anaka', a local tribal chief). The town near the foot of the lake is also called Wanaka. Lake Wanaka lies at the heart of the Otago Lakes in the lower South Island of New Zealand. The township is situated in a glacier carved basin on the shores of the lake and is the gateway to Mt Aspiring National Park. Lake Hāwea is a 15-minute drive away, en route to the frontier town of Makarora, the last stop before the West Coast Glacier region. To the south is the historic Cardrona Valley, a popular scenic alpine route to neighbouring Queenstown. At its greatest extent, which is roughly along a north-south axis, the lake is 42 kilometres long. Its widest point, at the southern end, is 10 kilometres. The lake's western shore is lined with high peaks rising to over 2000 metres above sea level. Along the eastern shore the land is also mountainous, but the peaks are somewhat lower. Wanaka lies in a u-shaped valley formed by glacial erosion during the last ice age, more than 10,000 years ago. It is fed by the Matukituki and Makarora Rivers, and is the source of the Clutha River. Nearby Lake Hāwea lies in a parallel valley carved by a neighbouring glacier eight kilometres to the east. At their closest point (a rocky ridge called The Neck), the lakes are only 1,000 metres apart. Small islands towards the foot of the lake include Ruby Island, Stevensons Island and Harwich Island. Some host ecological sanctuaries, such as one for buff weka on Stevensons Island. The towns of Wanaka and Albert Town are near the outflow into the Clutha River. For Māori, the Wanaka area was a natural crossroads. The Haast Pass gave access to the West Coast and its pounamu; the Cardrona Valley led to the natural rock bridge "Whatatorere", which was the only place that the Kawarau River and Clutha River / Mata-Au could be crossed without boats. Native reeds were used to build boats that enabled a swift return downriver to the east coast. The Cromwell basin supported a large population of moa, which were hunted to extinction about 500 years ago. Until the early nineteenth century, Wanaka was visited annually by Ngai Tahu who sought pounamu in the mountains above the Haast River and hunted eels and birds over summer, returning to the east coast by descending the Clutha River / Mata-Au in reed boats. Ngai Tahu use of the land was ended by attacks by North Island tribes. In 1836, the Ngati Tama chief Te Puoho led a 100-person war party, armed with muskets, down the West Coast and over the Haast Pass: they fell on the Ngai Tahu encampment between Lake Wanaka and Lake Hawea, capturing 10 people and killing and eating two children. Although Te Puoho was later killed by the southern Ngai Tahu leader Tuhawaiki., Maori seasonal visits to the area ceased. The first European to see the lake was Nathaniel Chalmers in 1853. Guided by Reko and Kaikoura, he walked from Tuturau (Southland) to the lake via the Kawarau River. However he was stricken by dysentery, so his guides returned him down the Clutha in a reed boat. By 1861, several sheep stations had been established in around the south end of the lake, and in 1862, the lake itself was surveyed in a whaleboat. The early European name was Lake Pembroke. In addition to ongoing sheep farming, the lake is now a popular resort, and is much used in the summer for fishing, boating and swimming. The nearby mountains and fast-flowing rivers allow for adventure tourism year-round, with jetboating and skiing facilities located nearby. The Wanaka region has been the setting for many international films, including The Lord of the Rings, The Hobbit, the Legend of S, and A Wrinkle in Time. Lake Wanaka repeatedly featured in the movie Mission: Impossible III as a location the lead couple visited and as the answer to Tom Cruise's question on the phone to verify the identity of his wife. The New Zealand cook and author Annabel Langbein owns a small estate at the side of the lake and filmed her series The Free Range Cook and Simple Pleasures here. With Queenstown airport close by, tourism mirrors that of the surrounding areas. 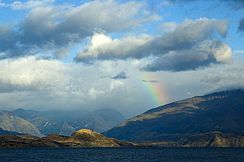 As one of the few lakes in the South Island with an unmodified shoreline, the lake is protected by special legislation, namely the Lake Wanaka Preservation Act of 1973. This established a 'Guardians of Lake Wanaka' group, whose members are appointed by the Minister of Conservation, and advise on measures to protect the lake. Oxygen weed (Lagarosiphon major), an aquarium plant and invasive species native to Southern Africa, has been a problem in the lake's ecosystem for some time. Attempts to eradicate the weed have not been successful yet. Substantial suction dredging operations have shown promise, but tend to miss isolated spots which then regrow into larger weed beds. Wikimedia Commons has media related to Lake Wanaka. ^ Taonga, New Zealand Ministry for Culture and Heritage Te Manatu. "19. – Otago places – Te Ara Encyclopedia of New Zealand". www.teara.govt.nz. ^ "What's Up DOC - Wanaka". Television New Zealand. Retrieved 13 October 2011. ^ Malcolm McKinnon. "'Otago region - Māori history and whaling'". Te Ara - the Encyclopedia of New Zealand. Retrieved 2017-07-11. ^ S Percy Smith (1910). History and Traditions of the Maoris of the West Coast North Island of New Zealand Prior to 1840. New Plymouth: Polynesian Society. ^ Atholl Anderson (1990). "Te Puoho-o-te-rangi". Te Ara - the Encyclopedia of New Zealand,. 1. Retrieved 2017-07-11. ^ Jock Phillips. "European exploration - Otago and Southland". Te Ara - the Encyclopedia of New Zealand. Retrieved 2017-07-11. ^ Roger Frazer (1990). "Chalmers, Nathanael". Te Ara - the Encyclopedia of New Zealand. Dictionary of New Zealand Biography. 1. Retrieved 13 July 2017. ^ Zealand, National Library of New. "Papers Past - PASSIM NOTES. (Otago Witness, 1889-04-25)". paperspast.natlib.govt.nz. ^ "The Lord of the Rings Location: Tarras & Wanaka". ^ "The Hobbit Trilogy Filming Locations". ^ Otago Daily Times. "Chinese fantasy filming in Wanaka". Retrieved 27 January 2018. ^ "Witherspoon, Winfrey and Kaling in Wanaka and Lake Hawea".